Well the day has arrived and I’ve just finished uploading the book – Life on Water! Last minute dash but I don’t think I’d have operated differently had I had more time! The idea, the photographs, the book all have changed from when I first signed up but I was determined to see this to the finish this year. Have to confess that I had lots of help from Ramesh and Anil without which it would never have got to finish! Do have a look and let me know what you think. The photographs were taken during a recent holiday to Bangkok, Siem Reap and Hong Kong. 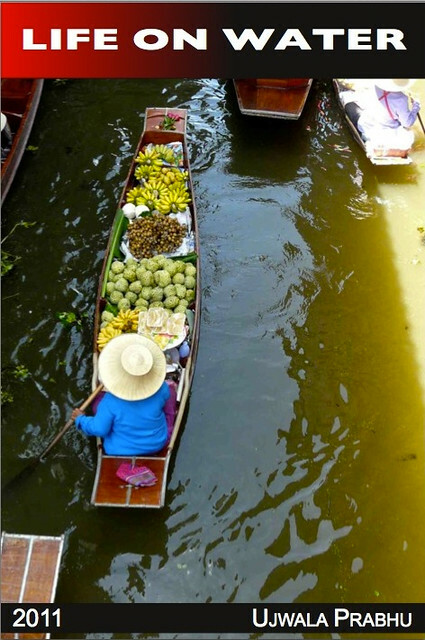 At our first stop we visited the Floating Market a little outside Bangkok. That planted the seed of a theme relating to water. Discovered that at our next stop I would have access to a Floating Village about an hours drive from Siem Reap. Then there was no stopping me and a supportive husband ensured that I visited Sai Kung in Hong Kong for more water related pics. This selection leans more towards photographs taken in the Floating Market due to the brighter colors that appeal to me. We were also lucky to have visited the Floating Village at a time when some parts of it were not “floating”. And since the water levels were low, the path where it normally flows was being used as a road and we got to see one of the house on stilts under construction! There were children lurking in the water with catapults to catch rats! And in the village we even got to see a pig sty on stilts! Much to my dismay I’ve had to leave out the temples, rickshaw pullers, fish, street photographs, snake charmers, wooden sculptures and portrait format pics as they wouldn’t fit in with my theme!! ! @#$%^^& and of course I’m going to pretend that those were the brilliant pics! : ) I hope to revisit this book to add some titles for the photographs and to rearrange them a bit. Click here to see the book Life on Water online and just in case : ) you want to read about the one from year before last click here or just see it on issuu. It’s been great fun and no pressure as SoFoBoMo sets no benchmarks for quality of photographs selected or the design of the book. I hope seeing my efforts will encourage you to join me for this project next year!! Congratulations on your beautiful book. I especially admire how deeply personal the work is. You clearly made your voice heard.